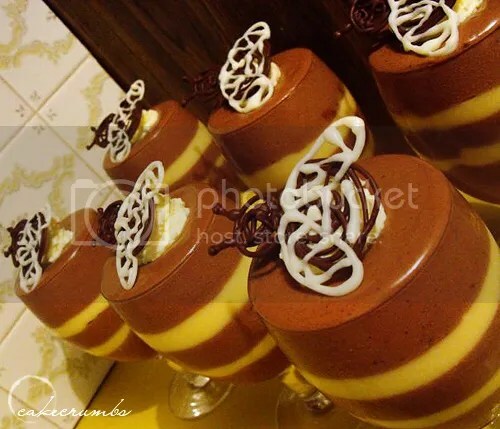 Bumble bee mousse is something I make quite often, so it should have been the obvious choice. 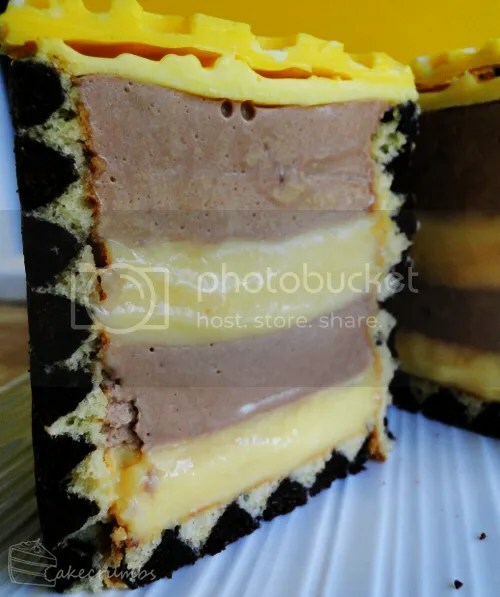 It's alternating layers of chocolate mousse and vanilla custard. I started making it years ago after my boyfriend and I visited my local pub for dinner one night. They often have a new once-off dessert on the specials board, and this night it said bumble bee mousse. He asked what it was and the moment he heard "banana custard" he just had to have it. We shared one and, while it was lovely, I really felt the banana flavour overpowered everything. While he was busy nomming, I was busy thinking about improving this dessert. I took photos of the first time I attempted it years ago with the intention of blogging, but apparently I never did. 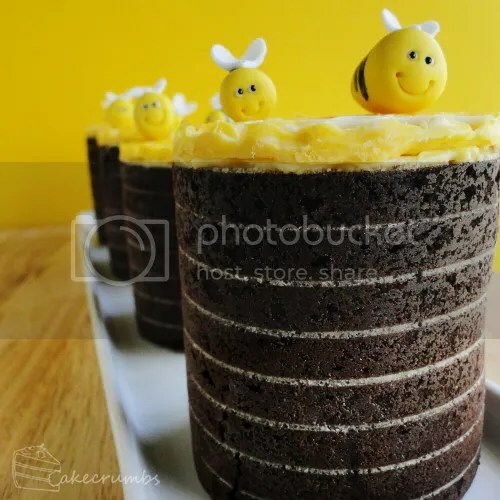 This is the glassy version, topped with cream and chocolate bees. Time to ramp up the difficulty. 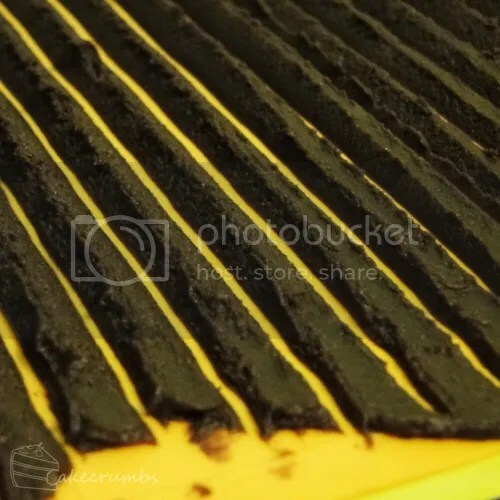 In case you're not yet aware of what a joconde imprime is, it's basically a decorative layer of paste baked into a thin layer of joconde sponge: the end result is called a joconde imprime. 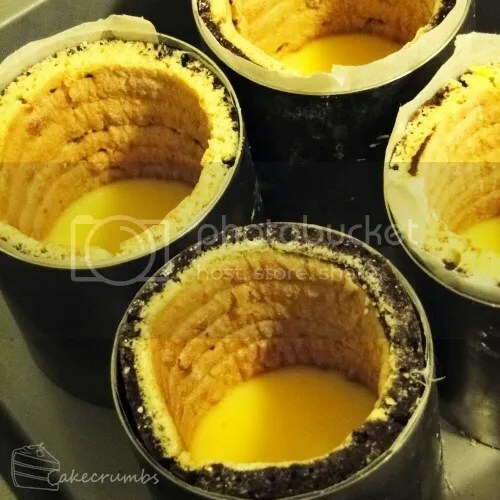 It forms a decorative outer layer of entremets (desserts) that are usually formed in ring moulds. The first step is making the décor paste. I went for chocolate, using dutch processed cocoa to get that lovely dark colour. If not using it to pipe, you need to spread it out really thin and evenly over your baking mat. My ring moulds are 24 cm in circumference, so I made sure the width was a little longer than that (the edges of the batter will burn). Next I took a decorators comb and pulled it through the paste to give those lovely, thin lines. 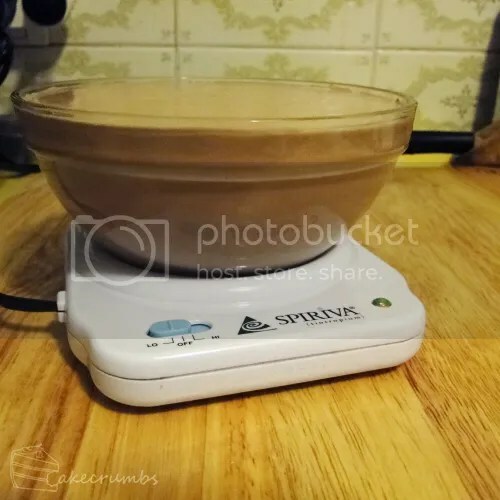 I bought it just for the occasions and was glad to find that they are easy to use. I used a pointed comb as I wanted the outside to be predominantly chocolate. If you want thicker or even lines, you can use a comb with flat, wide teeth instead. Alternatively, you can use a fork or your finger or anything you have on hand to pattern the paste. This has to freeze solid before pouring the joconde sponge batter on top. 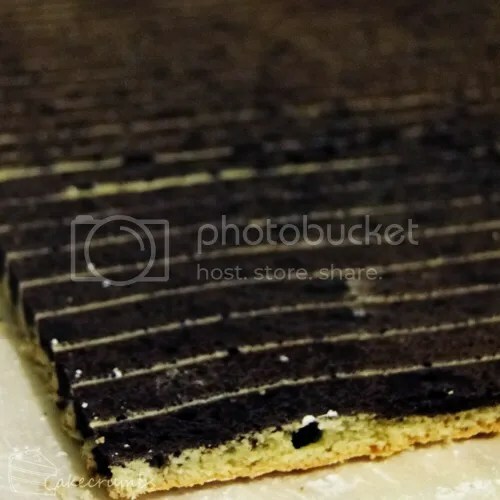 You need to spread this as evenly as possible (this will ensure the sponge cooks evenly through and will reduce the amount of burnt edges) and put straight into a hot oven. One it's baked, it becomes a juggling act of trying not to burn yourself and turning the sponge over onto a dusted surface before it completely cools. If it's too cool you'll have trouble peeling the mat back. It was at this point my sister approached me with my dad on the other end of the phone, asking if now was a good time to talk. "This is the worst possible time in my life anyone could ever talk to me." What can I say? I'm melodramatic in the kitchen. So when it worked, I danced around my kitchen laughing à la Smeagol when he finally rids himself of Gollum. The image of that scene in my head brought on even bigger fits of giggles. I cut the joconde imprime into lengths large enough for my ring moulds and there was just enough left over to cut 4 rounds for the base, so I didn't have to bake more cake. Yay. Now it's time to layer the dessert. First with the custard. 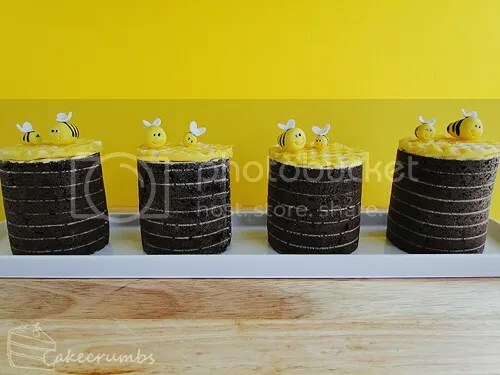 I used the lines on the inside of the sponge as a guide as to how much to fill it. At first I was going to make them really thin and do one layer per line, but I'm not that patient, so I went for 1 1/2. When I make this for the glass, I've worked out a way of pouring the custard to create enough surface tension to stop the denser custard from sinking into the mousse. But without the transparent container to work with this, I figured it was safer to chuck it in the freezer instead. It doesn't need to be frozen solid, just cooled long enough so that the layers wouldn't shift. While I was waiting for the layers, I poured the rest of the mousse into a bowl and put it on a mug warmer my dad got me from the op shop years ago. Finally found a reason to dig it out of the cupboard. I didn't put gelatin in the custard so it wasn't a problem for that, but there is gelatin in the mousse and I didn't want it to set while I waited. Today I unmoulded them and tada! They worked. 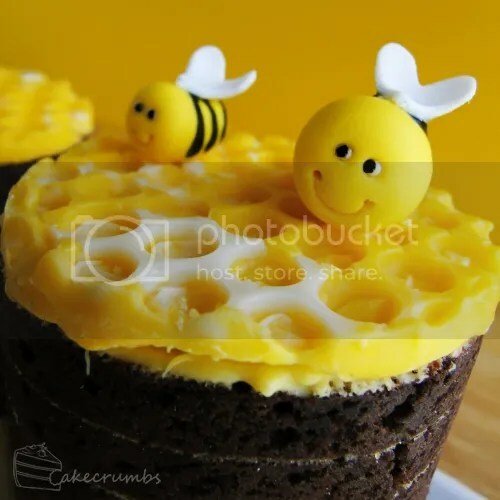 I topped each with a chocolate honeycomb topper and fondant bees, just for fun. Any excuse to make these guys. I also marbled the chocolate for the topper this time. The newer/outer rings of honeycomb created by bees are often lighter than the base, so I decided to use this concept but in a much more random way. And finally, the moment of truth: cutting the joconde. Much to my relief, the layers were perfect. I was worried about the custard not setting due to the lack of gelatin, but it was fine. While it still has a bit of give, it's not enough that it comes pouring out from between the chocolate mousse layers. This dessert can be made in advance (minus the toppers) and frozen until required. Avoid leaving it in your fridge for more than a few days as that tends to make gelatine-based desserts go rubbery, and the joconde sponge will go stale. If you're a lover of dark chocolate, it's definitely better aesthetically. We're milk chocolate lovers in my household, so the mousse is milk chocolate. You will only need half the quantity of mousse given here. 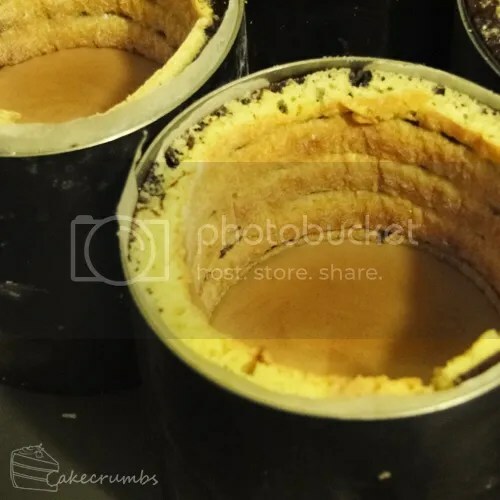 This is my go-to recipe for moulded desserts and fills all four of my ring moulds, so while I didn't need this much, extra mousse never goes astray in my house and I poured the excess into ramekins. Decide first if you want leftovers. Also, if you plan for your décor paste to be less prominent than mine or only wish to pipe with it, you could safely halve this recipe. In that case, double the joconde sponge recipe. Cream butter and sugar until light and fluffy; add egg whites a little at a time, beating continuously. Fold in sifted flour and cocoa. 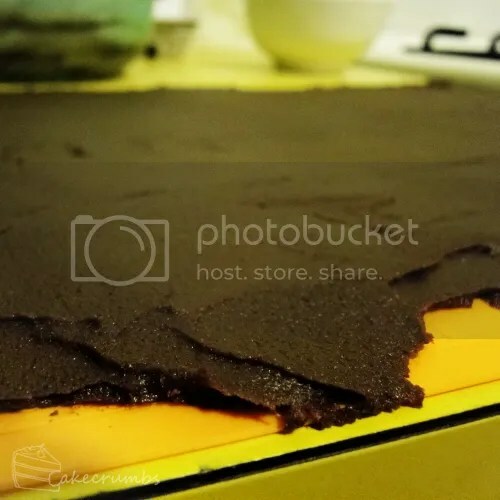 Spread a thin layer of paste (around 5mm thick) onto a silicon baking mat (mine is 26 x 40cm). Pattern your paste as desired; freeze. Whip the egg white and caster sugar to firm, glossy peaks. Set aside. In a separate bowl, sift almond flour, confectioner's sugar and cake flour together. Gradually beat in reserved egg yolks. If mixture appears too loose, beat in an extra whole egg. Fold in 1/3 of the egg whites to lighten the batter, then fold in the rest until just combined. Fold in melted butter. Ensure your décor paste has set. If it is not solid, the pattern may shift. Once the paste is solid enough, pour sponge mixture over the top and spread evenly. Bake in preheated oven for approximately 8 minutes. The sponge will cook very quickly, so keep a good eye on it. Sponge is baked when it bounces back when touched lightly. Remove from oven and cool slightly. 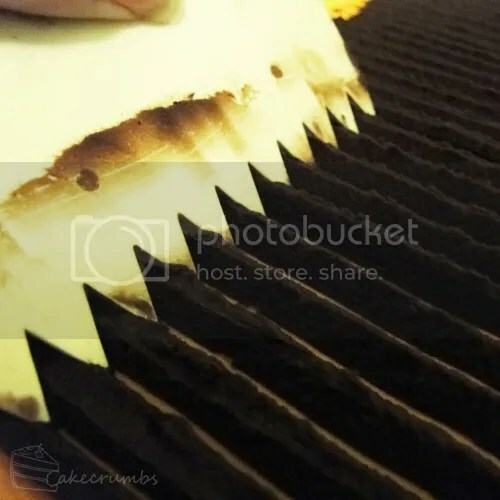 Invert cake onto baking paper (so your pattern is facing upwards) that has been dusted with cornflour or icing sugar; remove silicon mat. Once completely cool, cut away burnt/dry edges. Cut joconde imprime to desired size and use to line a prepared mould. Blend custard powder and sugar with 1/3 cup of the milk in a small saucepan until smooth and well combined; stir in remaining milk. Place over medium heat and stir until mixture boils and thickens; remove from heat. Add butter and egg yolk; stir until smooth and combined. Pour a layer of custard into the joconde moulds and freeze whilst preparing the mouse. Place gelatine and water in a heatproof glass and stand in a small saucepan of simmering water. Stir until mixture becomes clear; set aside. Heat milk until warm (a minute in the microwave will do it); pour in gelatine and stir. Whip cream to soft peaks. Fold 1/3 of cream mixture into the mouse to lighten; fold in the rest of the cream in two batches until just combined. Pour mouse over top of custard. If creating alternating layers as I did, return moulds to the freezer and keep mousse warm while waiting for the other layers to freeze. This looks very impressive to me! I don’t remember that mug warmer from your Dad – good it got some use. The marbled effect on the honeycomb topper is a nice touch. It was one of those op shop runs, been stashed in the cupboard for the last 3+ years. These are AMAZING. I seriously want to make these, but have no idea what I’d make them for…kudos, these are incredible. 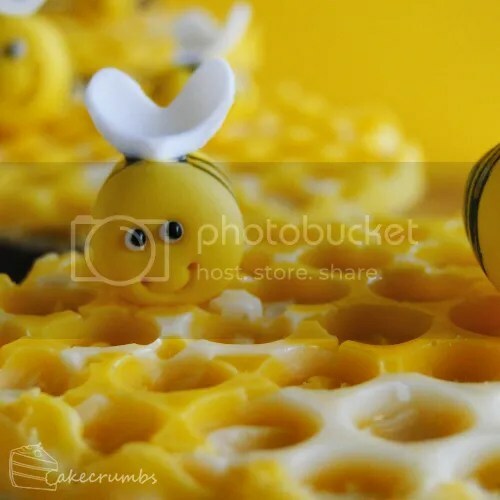 What did you use to make the honeycomb topper? Some sort of mold? Thank you. 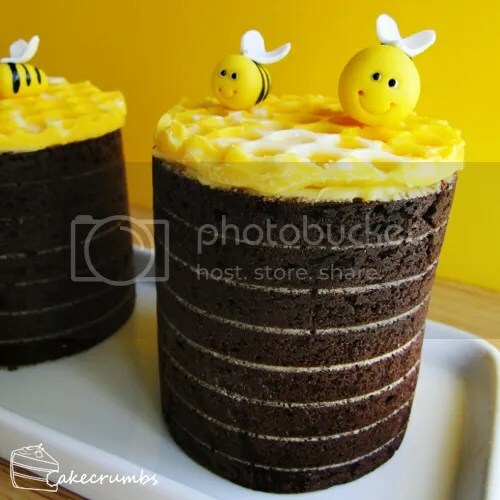 ♥ The toppers are just chocolate poured over bubble wrap – one of my favourite, and the easiest, chocolate decoration to do.